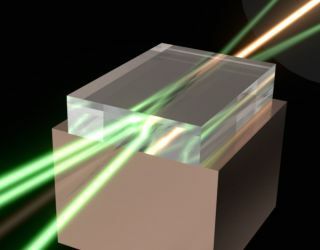 The "super" laser brings together the power of multiple laser beams directed into a single intense output using an ultra-pure diamond crystal at the point of convergence. Though it's not big enough or strong enough to destroy a planet, scientists have developed an amplified laser reminiscent of the Death Star from "Star Wars," according to a new study. The futuristic superweapon combines multiple laser beams into one destructive blast, the researchers said. The idea of merging laser beams is not new, nor has it been limited to science fiction before now. A decades-old Russian missile defense project looked to use liquid as a beam combiner, but that project was abandoned after it was deemed not practical. A similar project in the U.S. investigated laser fusion, but using different materials. Now, a team of Australian scientists has combined the principles of these two research projects and applied them to a new material: diamond. Diamonds also have high thermal properties that allow them to harness the laser beams' energies without overheating — a concern with other materials that could be used to combine the laser beams. "The fundamental problem is that the laser materials struggle to dissipate the very large waste heat load," study co-author Rich Mildren, an associate professor of physics at Macquarie University in Sydney, Australia, told Live Science. "There are technologies on the verge of having enough power, but heat build-up causes the beam to flare and power to drop leading to a lack of power on target." Researching amplified-laser concepts has become increasingly important as new security threats have arisen, Mildren said. From low-cost drones to missile technology, militaries around the world are looking to high-power lasers as a possible defense solution. Initial tests of the diamond laser have shown success in short bursts, and the researchers said they are continuing to test the laser for longer periods and at higher powers. When fully operational, the amplified laser could disable drones, missiles and other small objects, according to Mildren. "Such high-power lasers are also potentially useful in management of space junk, propulsion of small space vehicles and beaming power to remote locations," Mildren said. The proof-of-concept laser was described in a study published online March 30 in the journal Laser and Photonics Reviews.